Allergy Friendly Halloween Treats (Top 8 Allergen Free!) | Ignite Nutrition Inc.
Halloween is one of the most fun and creepy times of the year – however, it shouldn’t be the treats that spook us! For many people, holidays that centre around snacks and candy can induce a lot of fear around managing food allergies and intolerances, especially when you’re trying to find allergy friendly Halloween Treats! Food sensitivities affect 1/5th of the population, and most common food sensitivities are often staples in our diets – making them challenging to avoid! As a dietitian who specializes in GI disorders, I work with many different conditions that have food sensitivities & allergies, including celiac disease, eosinophilic esophagitis, and more traditional IgE mediated food allergies, like peanut, soy, egg or dairy. 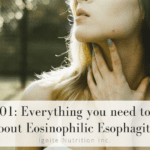 One of the most challenging conditions is Eosinophilic Esophagitis (EoE), a condition that causes inflammatory immune response in the esophagus, requiring short term elimination of the top 8 priority allergens (also known as the ‘6 food elimination diet – combining seafood and all sorts of nuts), often resulting in the need to avoid at least a few of them forever. Now that you’ve seen the list – I’m sure you’re wondering – what is left to eat? Sure, it might be easy to prep meals at home – but often times, this list leaves us feeling like we can’t ever have a snack or a treat again, and when something like Halloween comes around, it certainly can feel isolating. Let’s be clear – avoiding allergens should not mean you have to feel isolated or like you can’t enjoy food! Luckily, there are brands that are allergy conscious and are making celebrating Halloween a lot simpler for those with food sensitivities. 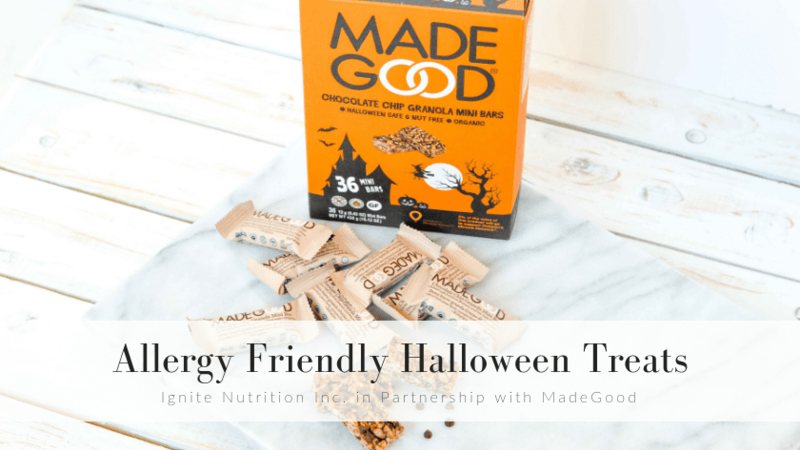 Ignite has partnered with MadeGood– to bring you our top 3 tips for choosing allergy friendly Halloween treats – perfect for all you allergy conscious ghouls and goblins this Fall! Whether you’re heading to a Halloween party or simply packing school lunches, there are lots of great homemade snacks that are totally free from the ‘big 8’ allergens. Try making some of your own allergy-free snacks like smoothies, energy bites, or homemade ice cream (with coconut milk). For some more recipe inspiration that is guaranteed to be allergy-friendly, check out Ignite Nutrition’s EoE snack guide. Don’t have a lot of time? Go for simple, whole foods that are naturally free from allergens. Think about foods that are “closer to the farm” with less ingredients. This makes it much easier to identify any potential food triggers. These types of snacks may include fruit, raw vegetables with hummus, roasted chickpeas, pumpkin seeds, or air-popped popcorn. As you now know, one of our favourite allergy-friendly brands is MadeGood. 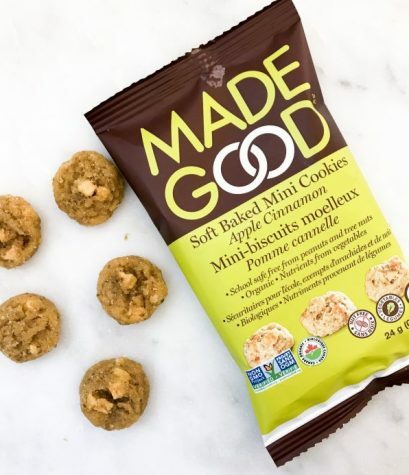 This awesome company is passionate about making bite-sized snacks for kids and adults alike that are completely free of the ‘big 8’ allergens. Not only are they allergen friendly, they are certified gluten free, vegan, and even offer a full serving of vegetables! 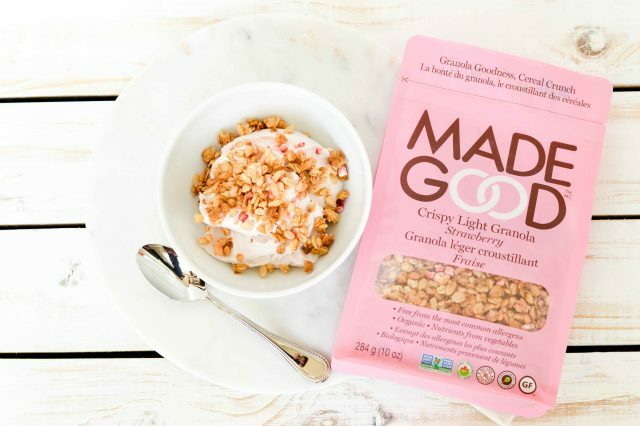 One of our favourite grab and go snacks from MadeGood is their Crispy Light Granola– we like to sprinkle the strawberry flavour on coconut yogurt for a filling, balanced snack. Talk about inclusive snacking for those looking to provide allergy conscious trick-or-treat’ers safe snacks. This fall, MadeGood has released some new products that are perfect for Halloween. 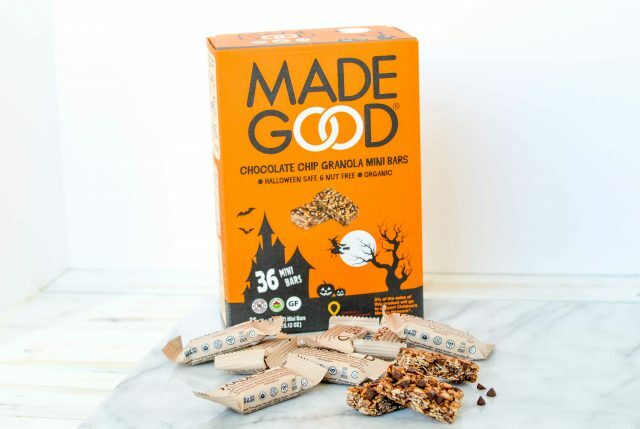 The Chocolate Chip Granola Mini Bars even come in a Halloween pack of 36; perfect to send to school for sharing or to hand out to trick-or-treaters! Our other favorite treat is their soft-baked mini cookies– they’re oh-so-tasty while also being school safe. Not to mention, they come in a variety of flavours, so those with allergies aren’t stuck with bland and boring options. Check out the apple cinnamon– so perfect for Fall! So, this Halloween I challenge you to think about how food allergies and intolerances may affect your family, friends, and neighbours. By making an effort to eliminate problematic allergens, you can give those around you the ultimate treat – no tricks – by providing options that will normalize the Halloween experience and keep it fun for everyone! 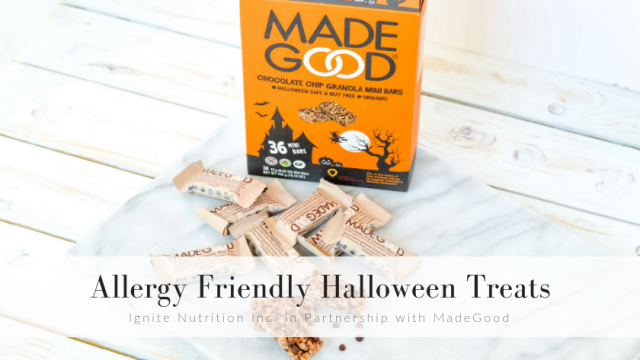 Choosing products you can give out this Halloween, like MadeGood, is the perfect way to ensure everyone feels included, whether they are allergic to peanuts, have celiac disease, or don’t have allergies at all! 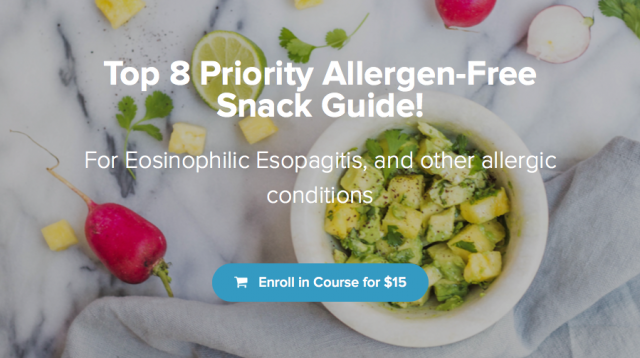 If you struggle with allergies and intolerances, or have Eosinophilic Esophagitis, consider working with one of our registered dietitians to help you manage your nutrition!